All the items in the room and where you can find them will be listed at the bottom of the post. Overall, I am happy with how it turned out. The room we had for her is the smallest in the house and I was concerned that we wouldn’t be able to decorate it the way I wanted. I am not great with styling or design, I am not crafty and we didn’t have a huge budget. But I feel that we were able to do exactly what I had envisioned with minor concessions. There will be some changes to the room in the future and it’s not 100% complete, but it is as complete as it will be until Alexis starts sleeping in it ( which she currently isn’t and probably won’t be for a long time). I am planning on adding pom-poms in the ceiling corner and a bookshelf, but this is as final as it’s going to get for a while. The chair is the only thing that doesn’t completely match, but in order to get a white chair I would have had to either sacrifice my comfort or price. So this was a good middle of the road rocker/recliner that is insanely comfortable. The rug is temporary, as well. I haven’t been able to find a rug that fit the room perfectly, so this cheap Target rug will do for now until I find something more appropriate. The crib skirt and bows were made by my sister who lives in Russia. She did an amazing job, considering she’s not a seamstress and went off of our measurements. We opted for no bumpers (even though I had a very cute one in mind) and an organic muslin crib sheet and a Naturepedic mattress. I debated buying children’s canvas art for the room or framing my own photography. I am glad I went with frames, because that means I can switch out photos once in a while when we get bored of them. The dresser was a old craigslist dresser that we had refinished. And yes, I am aware the handles are upside down. No, it wasn’t on purpose :). Since the dresser is old, the only crafty thing I managed to accomplish was lining the drawers with pretty purple and white fabric that I ordered online. We have two mobiles over the crib. 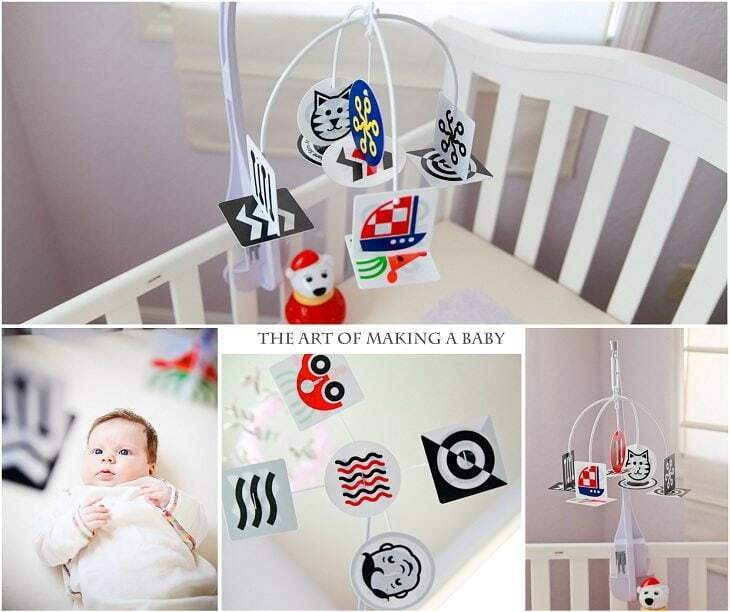 Wispy soft and cute one for looks and for when Alexis is a bit older to be interested in such delicate things (see how to win one), and another developmental crib mobile made out of black, white and red plastic shapes that encourage baby‘s visual development. Needless to say, Alexis loves it as much as she does her black and white board. It took nearly to my due date to find a chandelier that we both liked. I didn’t want it to look cheap with plastic crystals and anything with real crystals was either too big or over the top. This one came in black and was exactly what we needed after some spray paint action. Lamp: Shade from Layla Grace, base from Ebay painted white. Flower vase: vase and flowers from Michael’s, cut and arranged by me. Frame: a gift from ex-neighbors. They framed Alexis’ announcement which I thought was so creative. Drawer Liners: Made using foam board from Michael’s, cut to size. Fabric ordered online. And that’s pretty much it. If you have any questions, feel free to ask in the comments. Denise from Magical Whimsy Etsy shop would like to offer my readers a chance to win $100 to her Etsy shop. 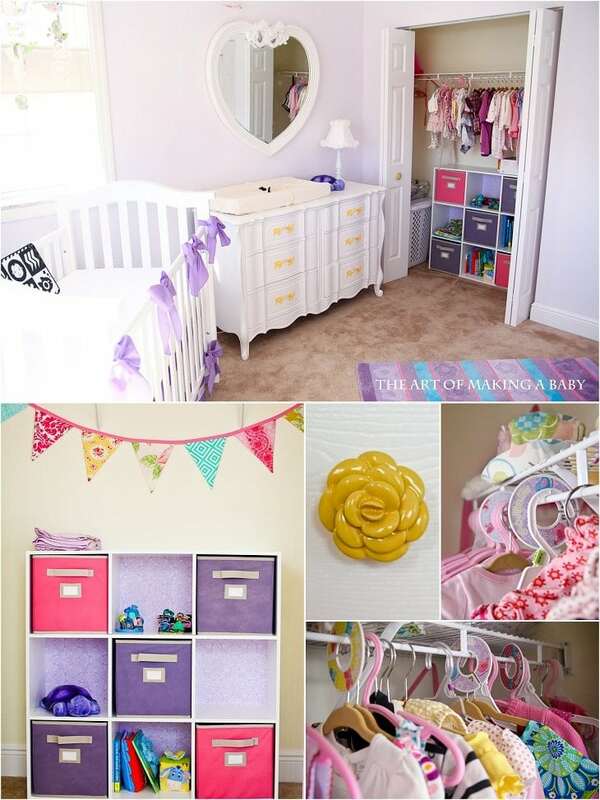 So if you have a little one on the way or just need a nursery revamp, feel free to enter. and daily entries for which you can come back to enter daily. This giveaway is open internationally. one piece of advice. I cant seem them in the pictures so you may already have them…but those cords on the blinds are a hazard. Get those wind up thingys for them NOW……if you wait, you will end up forgetting or just figure “eh, she doesnt touch them, she’s fine” and then have it not be fine. The nursery itself is darling….and quite honestly those handles on the dresser are more practical upside down because they look like they would be easier to use with the open part up (especially since you are so tall). Part of the plan 🙂 she doesn’t use the nursery and probably won’t for a while. 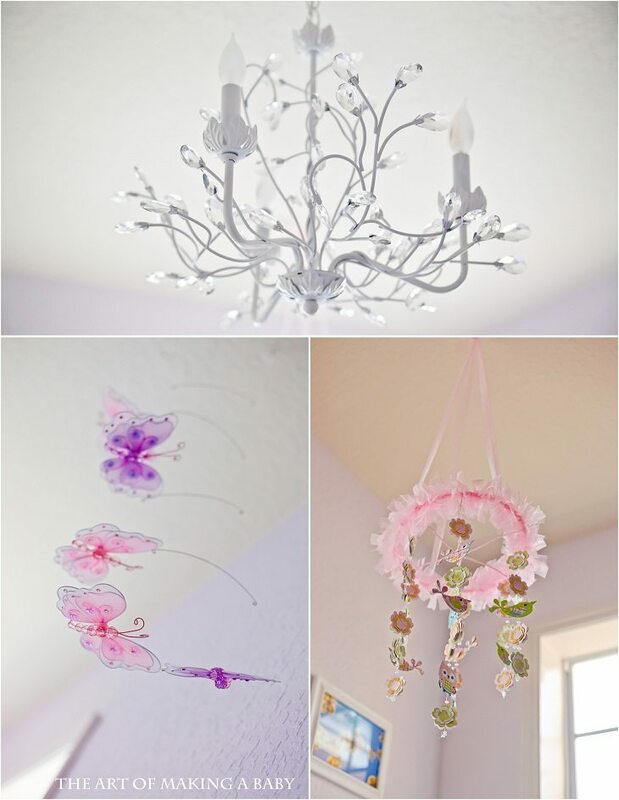 Her nursery is gorgeous!! Absolutely love everything about it! That picture of you holding Alexis over your head is so precious! And her headband is too cute! I loved this post! Thank you for sharing!! Wow, I’m a little surprised at the comment that is focused on the cords on the blinds. You clearly have common sense and know how to keep your baby safe. I have read every post of Elenas blog. I have been with her (almost) from the beginning. I KNOW she “has common sense” She doesnt appear not to….She even posted a million years ago (when she was deciding on what kind of blinds she was going to get) about the winder things. Sometimes things slip our minds because we have 9 million other things going on when we first have babies (and continue to have going on even after the baby stage) . Elena’s baby will be crawling soon, pulling up soon…..granted, she doesnt sleep in there right now but things happen in the blink of an eye. It was just a gentle reminder because like I said earlier….things slip our minds and then it might become “meh, she’s ok…she never goes near them” and then for the 3 seconds we are in the bathroom (or blowing our noses) they decide to go near them. What a lovely space! I really like that it’s kind of a hodge podge of different things and ideas. That makes it unique and personal. I love the recliner! I have one very similar to it that we bought when I was pregnant. Everyone said we needed a glider, but Mommy wanted a big soft leather recliner. I gotta say, I went with a rocker recliner too and even though it’s a bit chunky in the room, I LOVE it. I hate how hard wooden rocking chairs are and it it just about comfort. Absolutely beautiful nursery! And … you look fabulous! You look AMAZING! And Lexi is adorable, obviously. I love the crib! What is the brand/model? Thanks! What a nice light filled room. I’m not sure if you are intending to keep the bows on the cot, but they pose a huge potential choke hazard if you don’t take them off when your little girl starts sleeping in there. Love it! Girly but not over the top obnoxious! 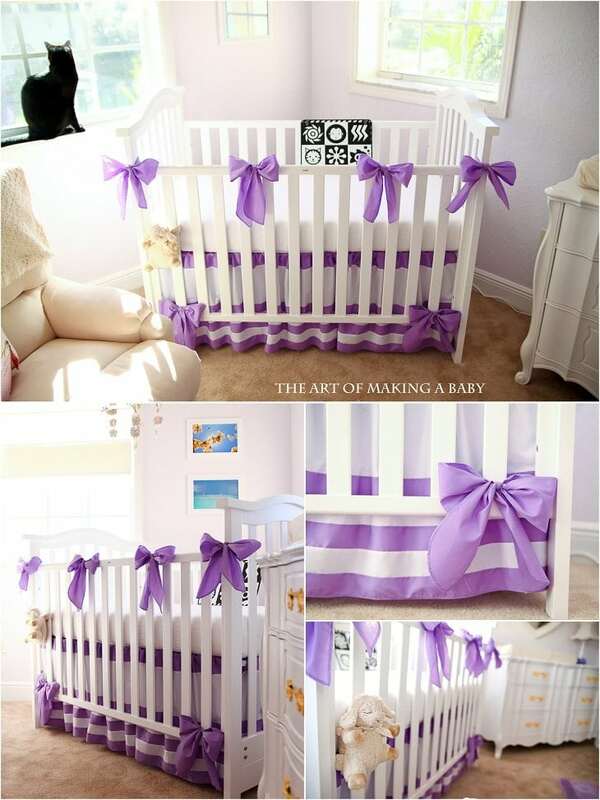 Are you planning on taking the bows off the top of the crib? All I see is danger with those, but everything looks amazing! Either that or I’ll sew them together and see how I can attach them more permanently. Definitely not leaving them like this though. Thanks 🙂 Re: craigslist dresser, there are actually a ton of dressers like that constantly popping up on CL. I guess it was a style back then. All you have to do is refinish it. We just finished our nursery and also have blinds with cords-trying to find the cord winders was a total pain! We eventually found some in Ace hardware, they’re not fantastic but do the job. I couldn’t believe how hard it was to find such a simple, essential item. I love the room, Elena! And thank you for posting where everything is from. My favorite elements of the room are the mirror, the dresser, the owl, and the Ugly Dolls! Oh, and your own photography in the frames. I love seeing my own photos in my house but I’m terrible about having prints made… shame on me! Thanks for posting this! The nursery looks AMAZING! I know I’m way late. Where did you get your crib sheets?? 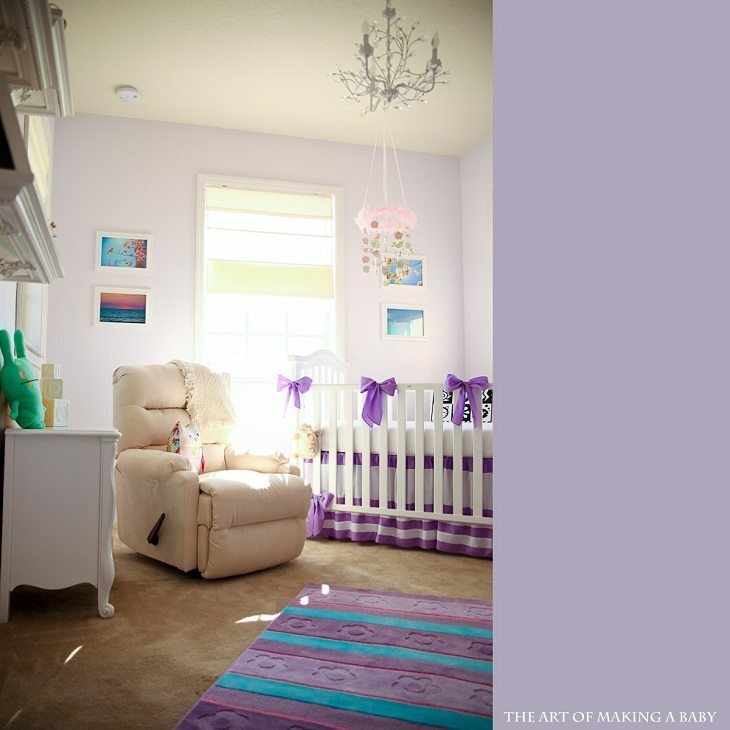 Lovely nursery room for a lovely baby.